Lenora is a California native with an undeniable spirit of adventure. In her first career as a documentary filmmaker, diving with sharks and tracing the footsteps of human origins were all part of a day’s work. But it was in Southern France, working on a film about wine barrel making, that she discovered her love for Rhone wines. A life change was on the horizon, and in 1983 she left San Francisco and moved her family to Big Sur to “raise a couple of kids and live off the land in one of the most beautiful places on earth." She honed her wine knowledge at Sonoma-Cutrer and when she started experimenting with grape growing on her land in Big Sur, she discovered that the Rhone varieties she had come to love grow particularly well in Monterey County. Three years after her first vintage, and months after opening a tasting room, the 2016 Soberanes fire devoured her home, vineyards, and olive grove. Without missing a step, and with great determination, she continued making wine and building her business. Lenora’s boldness and energy are reflected in her wines in their bright, complex and vibrant style. 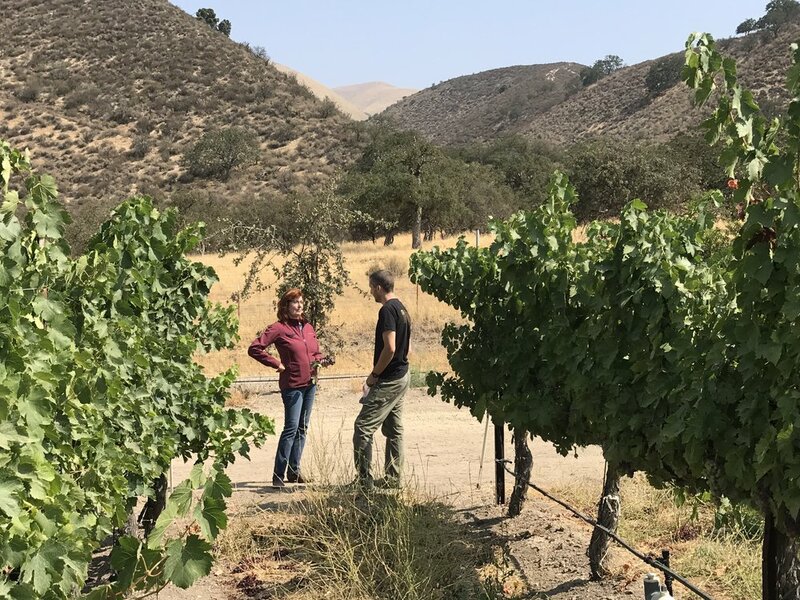 Lenora and Winemaker Ryan Kobza on location at Sycamore Flat, Arroyo Seco. Ryan is a young winemaker who shares Lenora’s adventurous spirit and has been making wine in Monterey County since 2011. Originally from Reno, Nevada, Ryan was first introduced to wine while working as a cook for several years. Looking for another outlet, he took classes in vineyard management which is his passion. He followed that education with an internship in Sonoma at Sonoma-Cutrer where Lenora also worked. Their paths intersected at a few points and from there, a friendship and partnership developed. Ryan’s passion for vineyard management is reflected in his desire to see what the more esoteric grape varieties can do in this area. With the many microclimates here in Monterey County, he believes experimenting with various grapes to see what will thrive and produce unique and beautiful wines pays off. Ryan works with Ian Brand and also makes wine under his own label, Kobza Wines. We are proud to be a multiple award-winning winery with several San Francisco Chronicle Wine Competition medals including Double Gold for our 2014 Big Sur Red, Gold for our 2016 Chardonnay and 2014 Pinot Noir and Silver for our 2016 Rosé and 2017 Grenache. The road to these accolades had humble beginnings. We started out on a small parcel of land on the edge of the Ventana Wilderness, overlooking the Big Sur coast. We planted a small grove of olive trees, and an essential oil garden of lavender and citrus and made hand-crafted soaps. Surrounded by artisan farmers, beekeepers and cheese producers, we were excited to plant grapes to see what might grow best in our soils. Over time a number of varietals showed great promise. It seemed our location had the right elements: its proximity to the ocean, summer heat during the day and cool nights. Winemaking started as a hobby. For many years we picked Grenache, Syrah, and Petit Sirah from neighboring vineyards. The kids stomped the grapes in small batches and we blended these three varietals together. One wine, Big Sur Red embodied all things we love and value about Big Sur. The wine is bold, with big flavors and yet a bit mysterious. Now, Big Sur Vineyards is a family wine business that is growing with each vintage. With a firm understanding of the terroir, and with evolving, more sophisticated winemaking goals, we constantly seek the next level. The first vintage was 2013 bottling Pinot Noir, Pinot Noir Reserve, Chardonnay, and of course, our Big Sur Red. We now bottle the individual Grenache, Syrah and Petite Sirah that go into our blends. We opened a tasting room in Carmel Valley in May 2016. It is an inviting, open space with an air-conditioned interior and a lovely patio with a view of the local mountains.